Welcome to the It’s a Wrap Blog Hop hosted by Cool Beans By L.B. If you've just arrived from Scrap Obsessed, you're in the right place. If you're just stopping by for a visit, and would like to hop along, go to Cool Beans by L.B. to start at the beginning. Do you like to receive gifts? How about give them? Well this hop is all about the outside…the wrapping; gift bags, boxes, baskets and more. There are 22 wonderful stops on this hop and we hope you will take some time to stop in and see everything we have created for you. Your next stop is Around the Block with Scrapalette! Super elegant. Love the red pop on this with the flower. Thanks! Super cute. I am loving zebra prints more and more and more. Great job on the flower that is just so beautiful. Your flower is amazing!!! Love the center! I love that flower! I'm trying to learn how to make paper flowers. Cute bag! 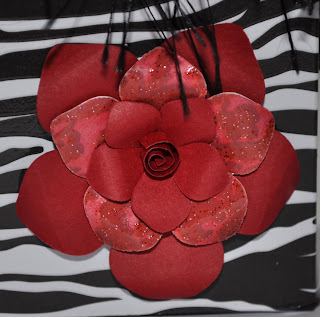 Love how the red flower adds the perfect touch to the zebra print. Fun trim on the top too! Very cute I just love the black and white pattern thanks for sharing. very pretty bag Roberta ! Love the flower...and it looks like a little purse. Cute! I absolutely Love it and I beleive that Anyone would be thrilled to recieve this Bag...I would!! I am a follower and love your Work!! TFS!! Loving this hop!! Very grown up, and elegent! Super cute! I'm already a follower. Beautiful flower, and bag, it looks bigger than what you say. Super fun bag! Great flower! Very nice! It is so simple, but definately makes a statement! Definately makes a statememnt. Simple but adorable. That bag really makes a statement! Love it! Wow!!! Gorgeous bag!! It is so elegant!! I always love your style! so much fun! When I saw you were on the list I couldn't wait to see what you created. I knew it would be something different and funky! I always love your projects- this one is no exception. Great job! This bag is gorgeous!! Love the red pop! Great bag! The flower is gorgeous! WOW!! beautiful! so love the flower!!!! Adorable!!!!!! I love those colors together. I love this bag!! So cute!! Thanks for sharing!! I'm your newest follower! very pretty bag! I'm a new follower! Love the bag! I love giving gift that are more than just is what is inside! Sooo cute! I love the bag!!! 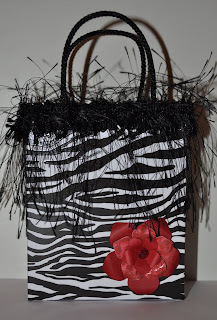 My daughter would love this bag - she recently is into animal prints! Super cute and funky! Love the flower! Wow, gorgeous!! Looks good enough to use as a handbag!! I'm so inspired by this blog hop already!! The flower is absolutely gorgeous!! TFS!